The ever-blurring borders of nations and the subsequent cultural, linguistic, educational, business, and economic shifts that take place are not going unnoticed by the U.S. Department of Education. 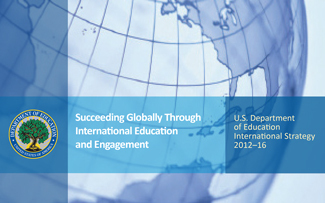 In November of this year, the Department released its first-ever document detailing a comprehensive international strategy, entitled “Succeeding Globally Through International Education and Engagement.” With the expressed aim of outlining a tiered, multi-step, and practicable plan for bolstering the U.S. educational system, this document represents a strategic step in the right direction. At the core of this plan are the values of a superlative education for all students, global competency training, applying lessons learned from other, successful countries, and educational diplomacy and engagement. An emphasis on these values should allow for a more systematic way of revamping education in the U.S., complete with standardized assessments and metrics of success. The rationale for implementing change, cited in the document’s introduction, has four primary parameters: engaging in economic competitiveness, meeting global challenges, maintaining national security and diplomacy, and incorporating a diverse society. It comes as no surprise that the Department should focus on competitiveness in an international market. To be successful in the current economic climate requires savvy that transcends borders and the knowledge and skills to compete against companies and individuals around the world. The strategic plan also emphasizes educational preparedness. In order to address new global issues, phenomena, crises, and challenges, students will need to acquire a deep understanding of the mechanisms that created them, as well as find diplomatic and cooperative approaches to resolving those issues. Particularly, knowledge of foreign languages, cultures, histories, and policies will continue to be essential to maintaining both domestic and global security. Finally, the strategic plan pays homage to the U.S.’ diverse population, asserting that nuanced and well-informed interpersonal skills will aid students in communicating with their neighbors, coworkers, and friends. “Succeeding Globally Through International Education and Engagement” offers several objectives and a number of implementable strategies aimed at achieving them. Relying on rigorous standards and assessments, the Global Competence Task Force (led by the Council of Chief State School Officers and the Asia Society) has provided the Department with global competencies for which to strive. These cover ground from geography and history to civics and art, and in the coming years, the Department aims to leverage Title VI programs to increase and broaden student understanding. The strategic plan also outlines how federal, state, and local education policymakers can learn from other, high-performing countries to drive innovation. By participating in international assessments such as PIRLS (Progress in International Reading Literacy Study), PISA (Program for International Student Assessment), and TIMSS (Trends in International Mathematics and Science Study), the education researchers can continue to pinpoint areas of weakness and strength and develop models that will better serve students’ needs. Emphasizing diplomacy, competitiveness, and innovation-driven success, the U.S. Department of Education’s strategic plan aims to improve the educational system and advance the nation’s international priorities. There is much room for progress, but a forward-thinking and globally-minded plan is the right place to start.